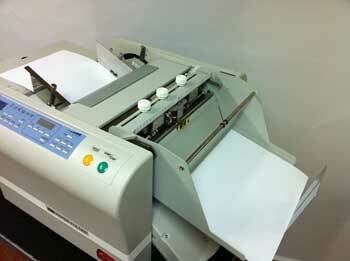 The Uchida F-47N including perforating attachment is similar to the Superfax PF-220. The innovative new Uchida F-47N is a fully automatic touch button setup with seven folds pre-programmed into the folders memory. This Uchida F-47N including perforating attachment has memory function with up to 36 different folding positions allowing you to store most bespoke jobs for repeat customers. The New Uchida F-47N folds up to 10,080 sheets per hour on A4 single fold. Reliable feed folding from B7 to A3 with adjustable seperating pressure and feed pressure to suit the thicker or difficult stocks (See Pictures Below). The counter has a total count with reset or batch counting with auto repeat functions. 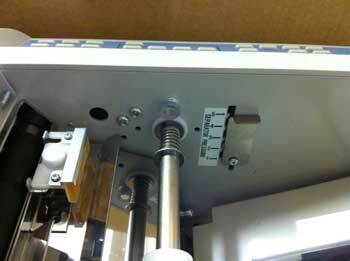 One key feature of the machine is the perforating attachment. On the New Uchida F47-N this comes as standard with the machine allowing you to perforate at high speed from sizes B7 to A3. One other feature of this machine is the hand feed unit, this allows you to feed collated stapled sets directly into the fold plates up to three sheets on a single or double fold. 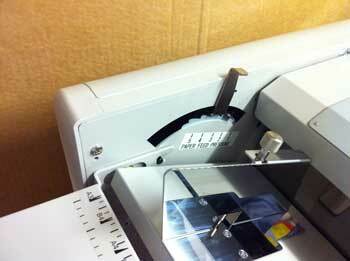 Please Note:When Cross folding the paper needs to be passed through the machine twice.